In Finish carpentry there are some air compressor accessories that can make the job easier. Most finish carpenters rely on pnuematic tools when it come to the jobs. These pnuematic tools will include obviously an air compressor and some finish nail guns, but there are some other things to consider also to make the jobs easier. 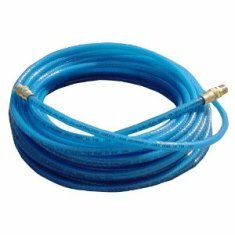 The air hoses I use and recommend are 1/4-inch premium polyurethane. This particular air hose is very durable, easy and light to work with, and wraps up nice and easy for storage. They come in various lengths and use standard connectors. 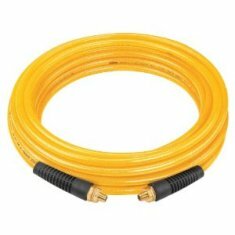 The air hose is soft and flexible and will never mar wood work when it is being dragged around and repells any dirt and dust. In the event where the hose gets damaged or punctured, there are easy repair kits to fix these hoses that can be purchased. I replaced all my rubber hoses with this particular style of air hose. 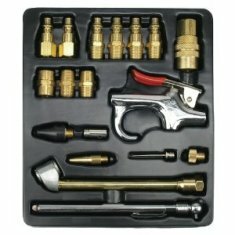 Other air compressor accessories you will need for finish carpentry will be a Pneumatic Accessory Kit. This kit most likely will include a Blow Gun, Blow Gun Nozzle, and Blow Gun Adapter, a few quick coupler connectors both female and male and various other accessories depending on the size and price of the kit. One thing to watch out for here is to be sure the quick coupler connectors are the same as there are different styles that DO NOT interchange. The blow gun is really the most useful here for keeping sawdust and dust out of all your tools. Blowing out the little electric motors and keeping moving parts clean and dust free will help the life of these tools. A tire gauge and other accessories may come with your kit and these are obviously useful in other applications and aspects of work and house hold uses. Many people have the misconception that you need a big expensive air compressor. In truth I do have an expensive portable air compressor however the one I used the most and preferred was a fairly cheap one I picked up on amazon. It was less then $200 and provided adquate air pressure to run 4 seperate finish nail guns and was much quieter then the more expensive model I had. I used this air compressor daily on the job for years and never had a problem. If you shop around some of the deals out there are tremendous. These days some of the manufactures offer package deals that include an air compressor and a couple nail guns and a few accessories for one low price. These are fairly good quality and for a diy'er would be handy for many uses other then just finish carpentry. Sometimes you can even pick the type of guns (finish, stapler, framing, roofing) you prefer in your kit. Once you have an air compressor, the air compressor accessories are almost endless when it comes to tools. Almost every type of hand power tool comes in a pnuematic form. One thing to pay attention to here is the PSI (pound per square inch) that these tools need to run. You will need a bigger air compressor that puts out enough PSI for some of these tools. Research will tell you this and it is always a good idea to do research on your tools before you buy them. 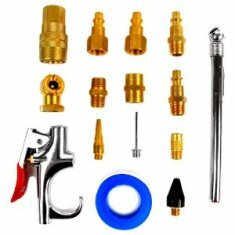 Return From the Air Compressor Accessories Page to Home - Finishcarpentryhelp.com.